We are delighted to announce that GBC2019 will be hosted by ESCP Europe at their Paris Campus, April 3-6, 2019. Full Programme: To be provided soon. Please stay tuned. The theme of Graduate Business Conference 2019 will be United in Diversity. Diversity and cultural blending have always been a part of ESCP Europe’s DNA. Therefore, it was only fitting that the theme of this conference be inspired by the same ethos. The motto of the European Union is, “In Varietate Concordia” meaning “United in Diversity. As one of the only Pan-European Universities, ESCP Europe deeply understands the importance of celebrating the differences that make individuals unique and valuable, and further, that it will be these differences that shape the future. Best Practice Sharing – Multiple facilitated discussions to learn and share with other student leaders about issues facing today’s MBA programs. Leadership Development – Keynotes from esteemed leaders, assessments and activities designed to help delegates better understand their leadership tendencies. Workshops – Sessions held on how to apply solutions to the most pressing problems faced as student leaders. 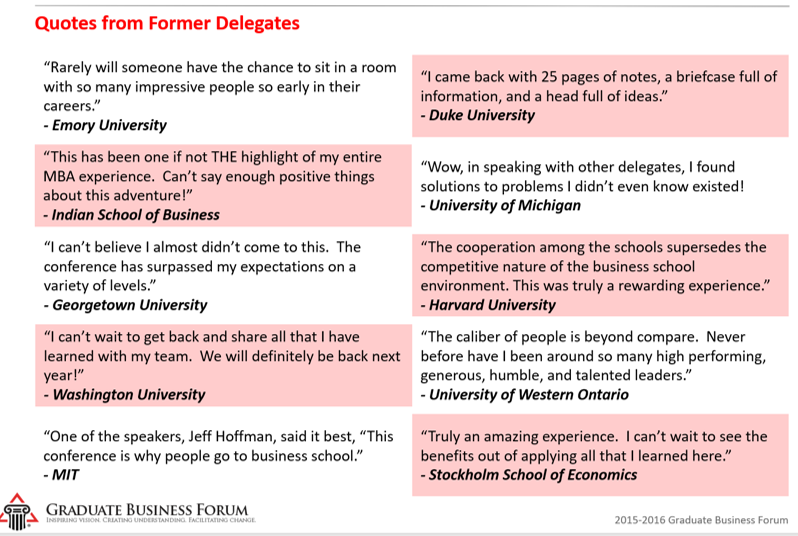 Networking – In addition to all delegates, full access to all attending alumni and GBF Executive Team. Leadership Awards – Annual event recognizing students who have gone above and beyond their roles as leaders creating an extra-ordinary lasting, positive impact for their school and/ or society.